We had another rainy, chilly day, all day and it sounds like the next two days will be very similar. Fortunately the rain has for the most part been gentle and we have had no flooding in our area. Today’s devotion was from Mary Ann and Gene and Gene again provided us music with his guitar. Gene used the book “Finding God in the Ruins”. He reminded us that things take time using Nehemiah’s return to Jerusalem of when there is so much to be done. We can become discouraged. Remember, it takes time. When we are doing certain projects, it seems to take forever to accomplish certain tasks. Remember, things take time. All things in God’s timing. After our time of prayer, Mary Ann then read us a funny “Recall of Human Beings.” Click and give it a read. 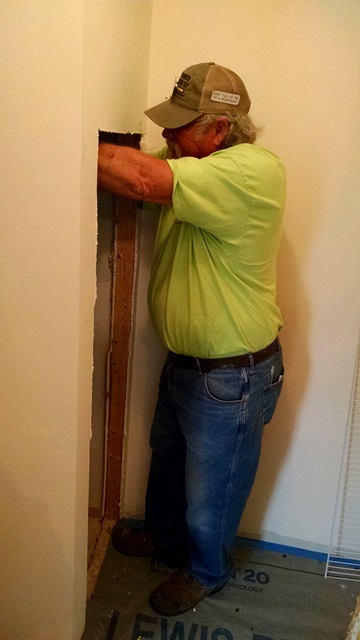 The entire team went to Jackie’s this morning, where we resumed working on the cabinets, crown molding, and doors. Max and Gene went to Lowe’s to do our shopping and returned with the needed water heater and pan. 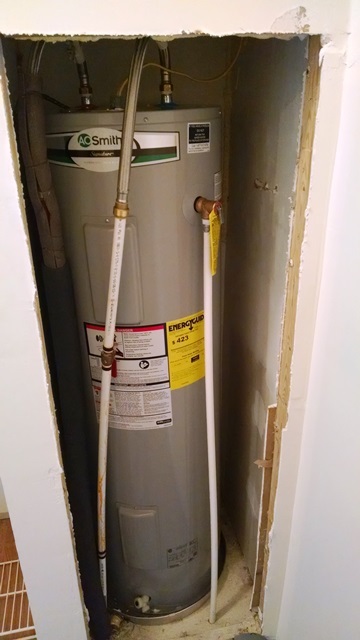 We decided to just keep everyone in one place until after lunch and Max and Gene were able to get the water heater installed. This was a big step toward getting Jackie back in her house. Jackie come by after lunch and we discussed the her kitchen counter top options and bath cabinets. Gene and Bruce headed back to work at Jim and Mary’s after lunch. Jackie’s house is really starting to look good. Lots of little things left to be done but we are getting close. After work everyone just wanted to return home for the evening. We have been busy the past few days. Anne needed to make another call to potential members. It’s raining again now. Maybe another good night to go to bed early – after some hot chocolate. Next Next post: All In?